I am currently a PADI Divemaster. I really liked you web page. Very nice. UW Movies are my passion. Just putting together my equiptment to do it right! 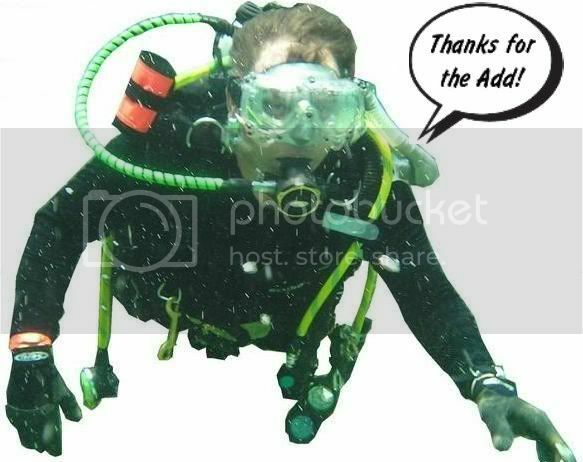 I am requesting you to be a divebuddy, maybe we can dive together on some of our Club Group dives! Check Clubs on divebuddy.com, I am an Ambassador (which means Greg ask for people to start up Clubs in their Area for socializing). If you go to my profile (MN #6444) and look at events you may see some you would like to join us on. Just RSVP and you will be contacted when we get positive Plans. This will add you to my data base for infomation on that Group Dive. How far through paramedic school are you? How do you like it so far?